The EZ-Flo Mainline Dispensing System connects directly to the irrigation piping after the back flow prevention device and the tank is designed for use under constant pressure. EZ-FLO’s patented flow process automatically adjusts to changes in water pressure and water flow without changing fittings. This product is designed to feed both sprinkler and drip irrigation zones for commercial, municipal, sports field, golf course, grower and residential applications. This system is designed for the delivery of products that are designated as non-hazardous. EZ-FLO Main-Line Dispensing Systems are designed to withstand constant static water pressure present in your irrigation system. These units are constructed of heavy-walled, UV-Resistant PVC and have no moving parts making them very reliable and maintenance-free. 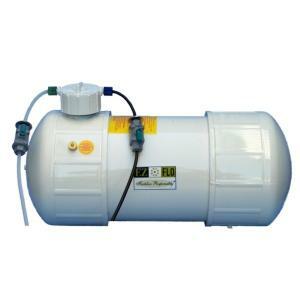 EZ-FLO manufactures units in varying tank sizes. The size of the unit represents the approximate capacity of the holding tank for the concentrated fertilizer. EZ-FLO Systems can be installed in minutes. We recommend that they be installed in an underground valve box but they can also be hidden under decorative rocks or housed in above ground structures when necessary. The only requirement is that they be installed after an approved backflow prevention device as determined by local plumbing code. Irrigation coupling connector. An approved EZ-FLO connection is the minimum required. An EZ-FLO ball valve connector (CBV) is HIGHLY RECOMMENDED for flow conditions less than 2 GPM, sloped landscapes or when using viscous products, such as heavy organic bio-stimulants, to ensure proper proportioning. Please Note Warranty Limitations: EZ-FLO main-line systems (Models: EZ001-CX, EZ003-CX, EZ005-FX, EZ010-FX) are designed to handle constant (static) pressures of up to 80 PSI and can withstand temporary pressure surges due to “water hammer” up to 150 PSI. Any unit that is determined to have failed due to excessive static water pressure will not be covered by Manufacturer Warranty.